I have a 77 kz900 that I am rebuilding the front caliper on. I can not get it back together for the life of me. I have tried assembling it with the piston fully seated (using c-clamp) but the caliper holder cant be put in when I do it this way. Can somebody shed some light. Also attaching a picture of my piston. Is this normal? Also should I get a new one since it is slightly pitted? I cant find any new ones online. You can buy new pistons from Z1E. Yours is pitted on the outside and I would trash it. There should be an O ring inside the cylinder. Remove it and make extra efforts to ensure there is no dirt in the O ring groove. It should be absolutely clean before replacing the O ring. Before inserting the piston you should make sure both holes into the back of the cylinder are clean. Blow air into them from the outside. Once the piston is back in place you can replace the dust cover and the steel ring holding it. When installing the caliper on the wheel I put it over the brake disc, using a screw driver to hold the pads apart. Once on the disc I move it into place to be bolted down but I install the brake line first...then bolt the caliper in place. I find it easier to install the brake line if there is some play on the caliper. I will give z1 a call to get a piston ordered up. Am hoping a new piston helps with my issue of not being able to assemble. The caliper floats on the bracket. Take the two bolts off and clean them as well. Replace the O rings. Everything has been taken apart and thoroughly cleaned. Got the caliper rebuild kit which has all new rubber and o rings. The sequence I described in my last post wasn't correct. After installing the piston, next is the metal ring. Place on the outside edge of the cylinder and tap it lightly, but not all the way into the cylinder. Then install the dust cover and then tap the metal ring all the way into the cylinder. Attached photo is a Z1 brake with piston installed. It's not identical to yours but it should be similar. The most common cause of the piston not fitting into the cylinder is dirt behind the O ring in the cylinder. When I rebuild them I use a pic to scrape around the edges to remove any dirt. The other thing that can build up there is dried brake fluid that needs to be removed. It's not easy to get in there but a few minutes with a pic and a toothbrush will do the trick. I wish my caliper would split instead of being cast, that would make this easier. Bama704 wrote: ......... The only company who has any is HVCcycle. Has anybody heard of them or had any experience dealing with them? Still working on this damn caliper. I can get the hanger bracket mounted in one direction no problem, except for it's in the wrong position. My caliper is in front of the fork tubes, so when I try to install the hanger bracket in the correct orientation, it is impossible to install. I am extremely frustrated. Any tips on this? Pics hopefully to get somebody to have any ideas for me. Piston is fully seated. Is the height of the new piston identical to that of the old piston? This may be a dumb question; is the pad opening in the carrier large enough for the piston to pass through? Can it be assembled if the carrier is placed in the caliper first, then the piston inserted through the back of the caliper, & through the carrier, then into the bore? It is the same height as old piston. Also, not a dumb question. 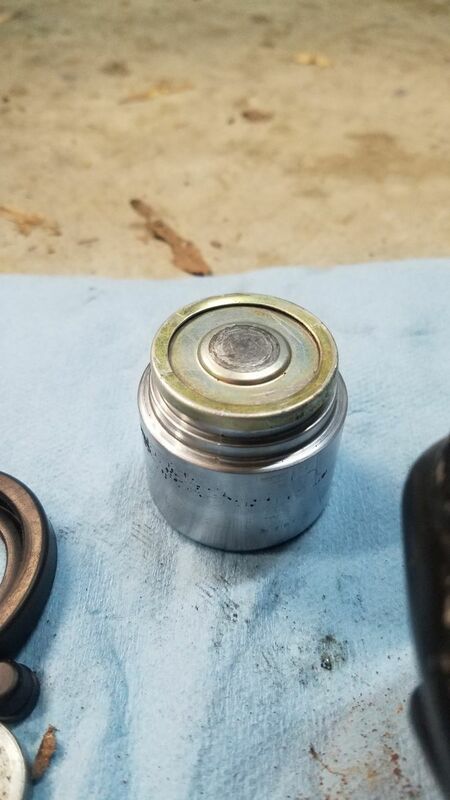 The piston will not fit through the opening, I have tried this about 20 different times all with the same result of me cussing of why it can't work. Well..., our experience is only on Z1's, so might not be able to help. Will the small end of the piston fit into the pad opening of the carrier up to the shoulder of the piston, such that the piston and carrier could be inserted into the caliper as a loose "assembly", then inserting the piston in it's bore with the carrier in place? Other than that we got nuthin'. We're assuming you disassembled it yourself? Perhaps a FSM would be of help. BTW, there were no KZ900's in '77 AFAIK. '77's were KZ1000's. EDIT: Just looked at the KZ1000 FSM. Should be the same caliper. It looks like things just go together the way you're going at it. Only other idea would be to check the bore of the caliper to make sure nothing is obstructing the ability of the piston to seat completely to the bottom of the bore. Remove the caliper's piston seal (not the outer dust cover) & make sure the piston bottoms completely in the bore. Good luck & let us know what the solution is when you find it. It's been a few years since I rebuilt one of those, but have you tried sliding the bracket into the body with the boots off to one side of the body, and then rotating the bracket so the boots slide behind the piston, instead of trying to push the boots over the top of the piston? I can be wrong but your caliper piston looks a little to long. In my opinion the piston should be on the same high as the rubber dust seal. I rebuild a lot of calipers but your piston high looks really strange. I got it all sorted out. Should this have been easy, yes. Did I make it more difficult than it needed to be, probably. I had trouble getting the dust seals over the piston, no matter the angle I put it in it wasn't working. Well, I lubed up the dust seals took another look at it and as I was sliding it in, much easier this time because of the lubrication, it was able to slide right in. It did not slide in at an angle, it slid in at a right angle just as the bracket would sit on the piston. The lubrication helped immensely.